A new food wrap made from crustacean shells and fortified with grapefruit seed extract doubles the shelf life of perishable food, say researchers. Thian Eng San, an associate professor at the National University of Singapore, and PhD student Tan Yi Min developed the material with food safety and environmental sustainability in mind. “Increasing attention has been placed on the development of food packaging material with antimicrobial and antifungal properties, in order to improve food safety, extend shelf life, and to minimize the use of chemical preservatives,” says Thian. Chitosan—a natural polymer extracted from the exoskeletons of crabs, shrimp, and lobsters—has inherent antimicrobial and antifungal properties. Grapefruit seed extract (GFSE), on the other hand, is an antioxidant and possesses strong antiseptic, germicidal, antibacterial, fungicidal, and antiviral properties. When the chitosan-based wrap without grapefruit seed extract was used on bread, fungi appeared after five days instead of three. Fungal growth was further delayed to 10 days if GFSE was incorporated into the chitosan film, the scientists discovered. The next-generation wrap also blocks out ultraviolet light, which degrades food due to oxidation and photochemical deterioration reactions. The innovation not only prevents the growth of fungi and bacteria but also has mechanical strength and flexibility comparable to commercial food packaging. 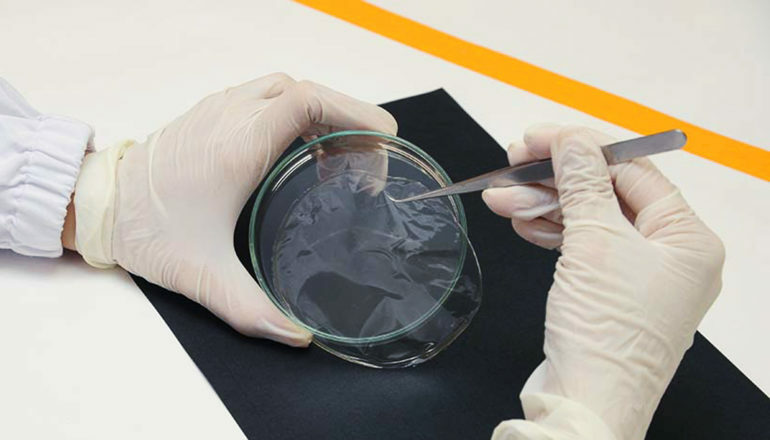 The researchers added a food-grade plasticizer to the chitosan-based wrap to make it less brittle. The fabrication process, which takes less than a day, involves mixing a solution of powdered chitosan and GFSE, filtering it, and then syringing a thin layer onto a petri dish. After drying in an oven, the solution turns into a transparent film. Larger sample sizes may take longer to produce, Yi Min adds. Presently, the researchers estimate that the film costs about 30 percent more than normal food wrap to produce, but they anticipate that a commercialized product will be priced similarly to its plastic counterparts. If the team is unable to bring down the cost, they hope that the wrap’s green features will appeal to those who would buy premium produce such as red meat, seafood, and dairy products. Right now, the biodegradable wrap is about three to five years away from being sold on supermarket shelves. The novel invention could reduce the sizable amount of plastic used in packaging. Currently, about 18.5 million tonnes—the majority of plastic production—goes towards packaging, which generates about 60 percent of plastic waste, according to the 2013 European Parliamentary Research Service.